Product prices and availability are accurate as of 2019-04-17 20:59:47 UTC and are subject to change. Any price and availability information displayed on http://www.amazon.com/ at the time of purchase will apply to the purchase of this product. This Whynter ARC-12S 12,000 Btu Portable Air Conditioner draws warm, humid air from the room and converts it into cool and fresh air. The sleek, platinum-colored mobile unit features auto drain technology for controlling condensation, an easy-to-install single hose venting system, and three operational modes: cooling, fan only, and dehumidifying. Three operational modes: air conditioner, fan or dehumidifier ; Noise level (dBA): < 52.5 Full thermostatic control (61°F - 89°F) with digital readout, 24 hour programmable timer. Maximum power consumption: 1080 W / 9.5 A Remote control, upgraded plastic window kit (46" max. 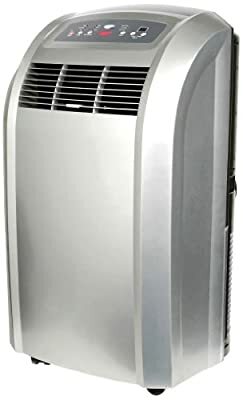 ), carbon air filter and washable pre-filter included Dehumidifying capacity of 91 pints per day, 3 fan speeds. Includes extendable exhaust hose (up to 60") and window kit (up to 46") Max. window kit length = 46" , Min. window kit length = 20"